Whether one is speaking of the Pendergast series or the Gideon Crew novels, no writing team equals Douglas Preston and Lincoln Child at creating a spine-chilling, page-turning suspense story. 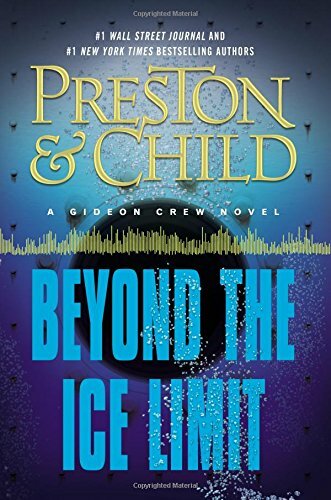 Responding to their fans’ demands for a sequel to The Ice Limit, Preston and Child offer Beyond the Ice Limit, a frightening answer to what happens after the sinking of The Rolvaag in the Antarctic waters off the coast of South America. The Rolvaag, chartered by the eccentric head of Effective Engineering Solutions Eli Glinn, is transporting the largest meteorite ever found from a remote island to the United States when a storm hits the ship. Although the captain and other members of the expedition demand that Glinn jettison the meteorite in order to save the ship, he refuses. The meteorite breaks loose from its moorings and sinks to the bottom of the sea, taking The Rolvaag with it. One hundred and eight crew members die, and although Glinn survives, he is horribly injured. Five years later, after the discovery of a plant on Lost Island, Glinn is able to abandon his wheelchair and walk again, although unsteadily. Along with his chief of operations at Effective Engineering Solutions, Manuel Garza, Glinn arrives by helicopter at Gideon Crew’s remote cabin in the Jemez Mountains of New Mexico. But Glinn’s guilt over the deaths of The Rolvaag crew and his fear of the eventual destruction of the earth by the alien seed pod drives him to mount the expedition, of which Gideon is the most important member. Gideon is an expert with nuclear weapons, and Glinn has procured a plutonium core of thirty kilograms, a neutron trigger device, as well as other elements necessary to constructing a small atomic bomb. “Now you know why I hired you in the first place,” Glinn tells Gideon. Gideon is incensed at being tricked, but finally agrees to accompany Glinn on the mission subject to being convinced that the pod is really that dangerous. More shocks await Gideon when he learns he will need to pilot a Deep Submergence Vehicle—DSV—to the bottom of the ocean to retrieve The Rolvaag’s black boxes and to get a first-hand view of the seed pod. “I don’t like being on the water, let alone in it—and two miles down, for Christ-sakes,” Gideon tells Alexandra Lispenard, who is charge of the DSVs. Alexandra is not sympathetic, and Gideon must learn to operate a DSV because he is the only one who can position the nuclear weapon to destroy the seed pod. Cable-like appendages ran along the seabed and disappeared into the roots of the pod aroused Gideon’s curiosity, so much so that he cut a sample and returned it to the ship for study. Among all the decisions that Gideon has made in his life. Taking a sample of the appendages may be the worst. Like the alien in the John Carpenter movie, The Thing, the appendages are capable of infiltrating a human brain and taking possession. The fear of the crew pushes them to the breaking point, unaware that they’re behavior is dictated by the appendage curled up in their brains. Whether one calls the novels by Preston and Child science fiction, fantasy, horror, or just plain thrillers, no one can deny that the writing team can make even the most fantastic plot believable. Their success in making the Gideon Crew series is the fact that Gideon is no superhero. He is an ordinary man whose extraordinary determination compels him to achieve a goal even when he himself believes he will fail. Another trait of Preston and Child as writers is that they weave just enough scientific or historic information into their story to add to its believability. And they keep it simple enough for the layman to understand. Kudos to Preston and Child for another story that will keep the reader up past bedtime.